I have a clear lime-green 599A that has a hooded nib, but these two came with open nibs. I discovered, upon doing some research (and I do realize how incredibly esoteric this is... trust me) that there were three generations of Jinhao 599A fountain pens---the original one with a slide-on nib, followed by one with a traditional friction-fit nib and finally, the latest incarnation with a hooded nib. Regardless of the nib type/style, all of the Jinhao 599A pens write well and would make excellent fountain pens for beginners. 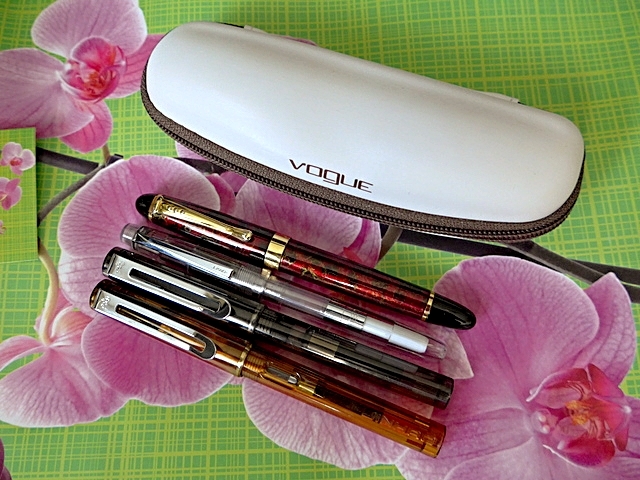 Both the Jinhao 599A model and the Wing Sung 659 (and the Wing Sung 698) are very light pens, and can be used for extended periods of time without tiring your hands. If you're looking for a much heftier, larger fountain pen, give the Jinhao X450 (or its slightly-smaller & skinnier counterpart, the X750) a go.